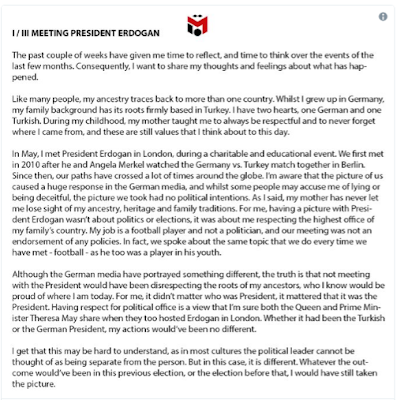 The Arsenal star was criticised by German Football Federation (DFB) after meeting with controversial Turkey president Recep Tayyip Erdogan in the lead up to the World Cup. 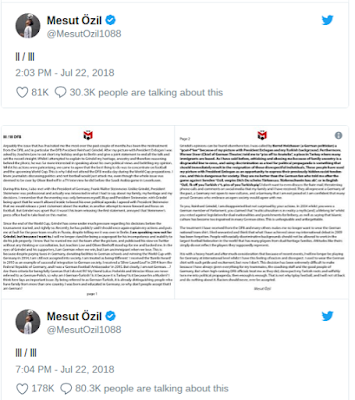 Ozil has responded saying he has been the victim of "racism and disrespect". In a three-part statement, he described himself as a "scapegoat" and said the Erdogan meeting had been unfairly characterised as a contributing factor in Germany’s shock group stage exit in Russia. The meeting had no “political intentions," Ozil said, referring to DFB president Reinhard Grindel as both "patronizing" and "incompetent." On Sunday the 29-year-old winner posted these words on Twitter: "In the eyes of Grindel and his supporters, I am German when we win, but I am an immigrant when we lose. This is because despite paying taxes in Germany, donating facilities to German schools and winning the World Cup with Germany in 2014, I am still not accepted into society." What followed was a lengthy and heartfelt explanation leading up to his decision to retire from the national team. "Arguably the issue that has frustrated me the most over the past couple of months has been the mistreatment from the DFB, and in particular president Reinhard Grindel. 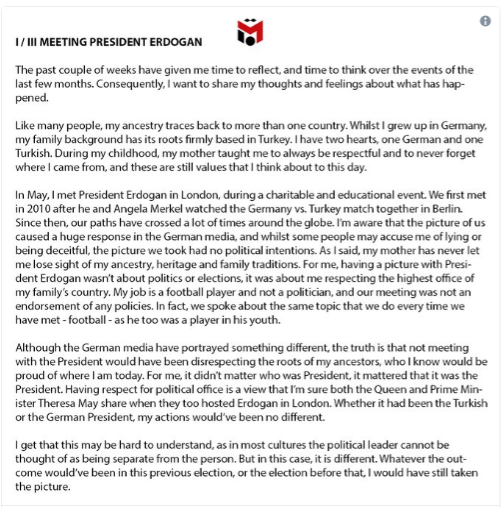 "After my picture with president Erdogan, I was asked by Joachim Low to cut short my holiday and go to Berlin and give a joint statement to end all of the talks and set the record straight. "Whilst I attempted to explain to Grindel my heritage, ancestry and therefore reasoning behind the photo, he was far more interested in speaking about his own political views and belittling my opinion. "Whilst his actions were patronizing, we came to agree that the best thing to do was to concentrate on the football and the upcoming World Cup. This is why I didn't attend the DFB media day during the World Cup preparations. 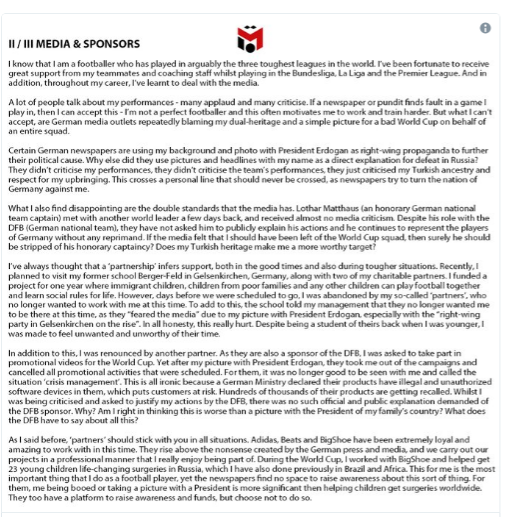 "I knew journalists discussing politics and not football would just attack me, even though the whole issue was deemed to be over by Oliver Bierhoff in a TV interview he did." Ozil, who was just eight caps short of the 100, scored 23 international goals and was a pivotal figure in Germany’s 2014 World Cup triumph in Brazil. He said despite his previous exploits with the national team he could no longer wear the shirt with pride. 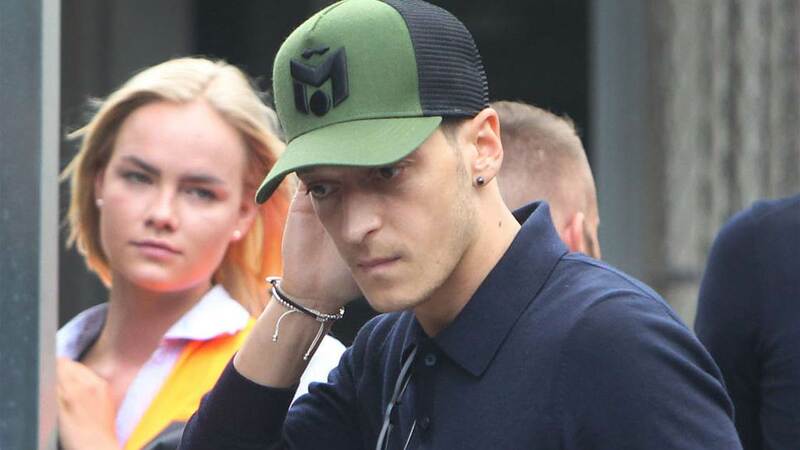 "It is with a heavy heart and after much consideration that because of recent events, I will no longer be playing for Germany at international level whilst I have this feeling of racism and disrespect."